Philip Seymour Hoffman's last major performance outside of the Mockingjay series leaves a sweet bitterness knowing this genius will never again inhabit complicated and intriguing characters on the big screen or in life. The John le Carré’s 2008 novel which was adapted by Andrew Bovell and directed by Anton Corbijn (The American) is and often times slow, dialogue heavy treatise on the American corrupted German intelligence services. The film shot in Hamburg Germany, the city where Mohamed Atta and his co-conspirators lived prior to the 9/11 attacks is the backdrop to the complicated political machinations of tracking down the finances of terrorist operations. Hoffman with a German accent plays Günther Bachmann who is the head of a special unit for all intensive purposes does not exist in order to cultivate their intelligence. He was once a brilliant agent, but one failed operation has not stopped him from continuing his prime objective, but has made him more world weary. He's over weight obsessively drinks, smokes, and sleepless but his team respects his nerve, his loyalty and keen observations. Bachmann have developed sources within the Islamic community. He is trying to corner Dr. Faisal Abullah (Homayoun Ershadi), a Muslim scholar and humanitarian whose charity work may be front for laundering money to extremist groups. The new blip on his radar is a 26 year old Issa Karpov (Grigoriy Dobrygin) a half Chechen, half Russian illegal immigrant who suffered torture and imprisonment in his country. He finds shelter with a Muslim woman and her son who connects him with Annabel Richter (Rachel McAdams) a young human rights attorney. She agrees to help him claim an inheritance worth tens of million of Euros. He doesn't want the money because it was ill gotten gains from his father. Bachmann schemes to use the money to trap Abullah. He reaches out to the head of the bank Tommy Brue (Willem Dafoe) where the money is being held. The head of intelligence in Hamburg Dieter Mohr (Rainer Bock) wants to bring in Karpov as a suspected terrorist. The charming if somewhat askew CIA agent Martha Sullivan (Robin Wright) convinces Bachmann she will keep Mohr out of his way while the operation goes down. There's the grim and bleak background that is prevalent in Cold War spy movies with cigarette drop off messages, surveillance cameras, and cryptic conversations where no one trusts the other. The plot is somewhat complicated and the pace of the movie seems often plodding with unimportant details. 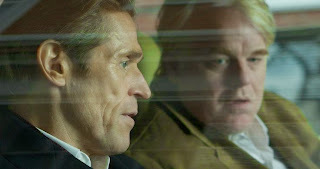 It's strange seeing Hoffman bloated and chain smoking throughout the movie as a harbinger of his final days. His portrayal of a flawed and bitter man brings out a tender and sensitive side in a world that keeps knocking him back. It's hard not to watch Hoffman and remember we won't be able to see him again.